We got our start early with the web, in 1990, trying out Tim Berners-Lee’s NeXT WWW browser and authoring tool. At the time, hypertext systems like HyperCard and online information systems like Gopher and WAIS were more common. In 1993, the release of Mosaic brought the web into prominence. In January 1994, we co-authored a chapter on Mosaic in The Internet Unleashed (first edition, Sams Books), and joined the Mercury Project team. The Mercury Project was launched in August 1994, and was the first Internet telerobot. A digital camera and air jet was mounted on a robot arm so that anyone on the Internet could view and excavate for artifacts in a sandbox located in our laboratory at the University of Southern California. A year later we were part of the team that launched the TeleGarden. 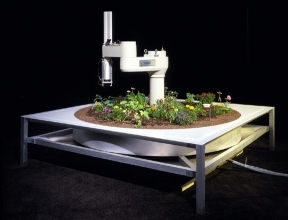 This telerobotic installation allowed WWW users to view and interact with a remote garden filled with living plants. Members could plant, water, and monitor the progress of seedlings via the tender movements of an industrial robot arm. Around the same time, we founded the USC TommyCam, one of the most prominent web cams at that time, and still in operation today. The Tommy cam not only updated the picture every few minutes, but we added code to make a daily movie, and a yearly noontime movie.